Home BOLLYWOOD Sushant Singh Rajput Receives Backlash From Twitter Over Shahid Kapoor Controversy! Sushant Singh Rajput Receives Backlash From Twitter Over Shahid Kapoor Controversy! 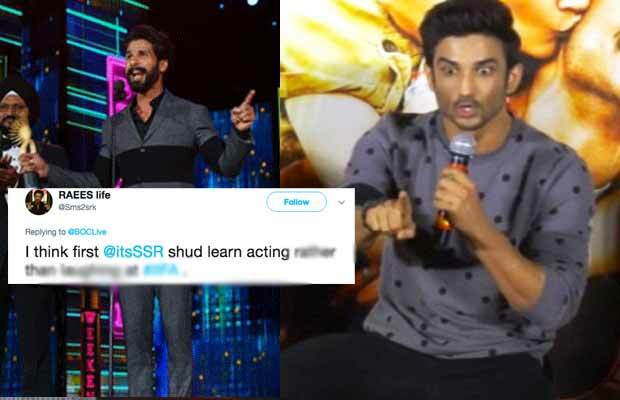 Bollywood actor Sushant Singh Rajput is getting trolled for his recent tweet during the IIFA Awards. Sushant Singh Rajput is an excellent actor and has paved his way in Bollywood on his own. The actor must not have given super hits but he has been appreciated for his acting. Rajput’s recent release Raabta did not fare well at the box-office. Yet, his role as Mahendra Singh Dhoni in the movie ‘M.S. Dhoni- The Untold Story’ got him accolades all over from Bollywood. Twitterati is making fun of the actor’s unacceptance for failure. Though a source said that it had nothing to do with not getting the award. He said, “Sushant’s tweet had nothing to do with the awards. It was simply an expression of having a successful graduation from a background dancer, to now being an actor performing at the very same award function. Infact the tweet was posted right after Sushant’s performance and had no relevance to the award ceremony. As opposed to the speculation, not getting an award doesn’t affect Sushant as he is very secure as an actor.” Whatever be the reason for Sushant’s behaviour, he is in a big problem now, though.